Last year I embarked on a photography project called the ‘Home’ series. 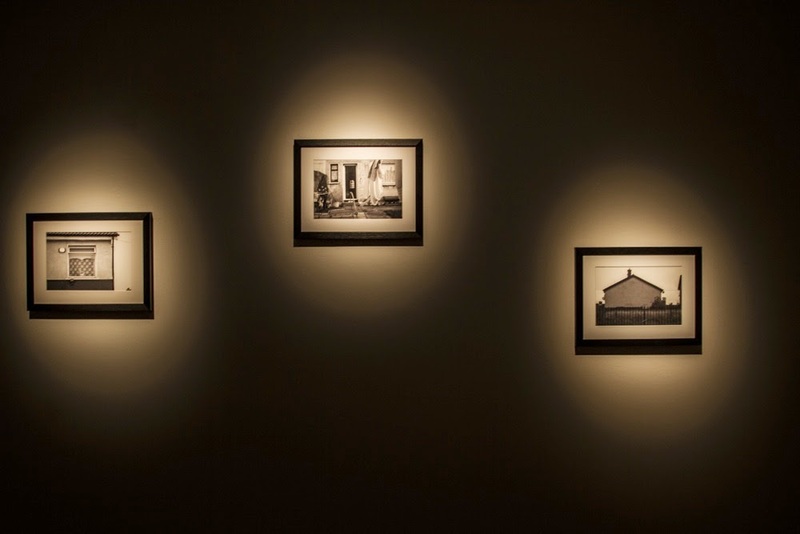 I began by taking photographs of house facades beside my own home. Behind every face there is a story and behind every facade there is a narrative. I am interested in how society stereotypes the home through the facade and how these stereotypes play out, how homes open up or cut off possibilities of social interaction? I wish to examine how society has adapted to living in the urban; can a facade provide insight into a narrative? Has the sporadic building of homes during the so-called ‘Celtic Tiger’ years changed our notion of the home? Is the phrase ‘The home is where the heart is’ still true today and what is the ideal home in urban society? 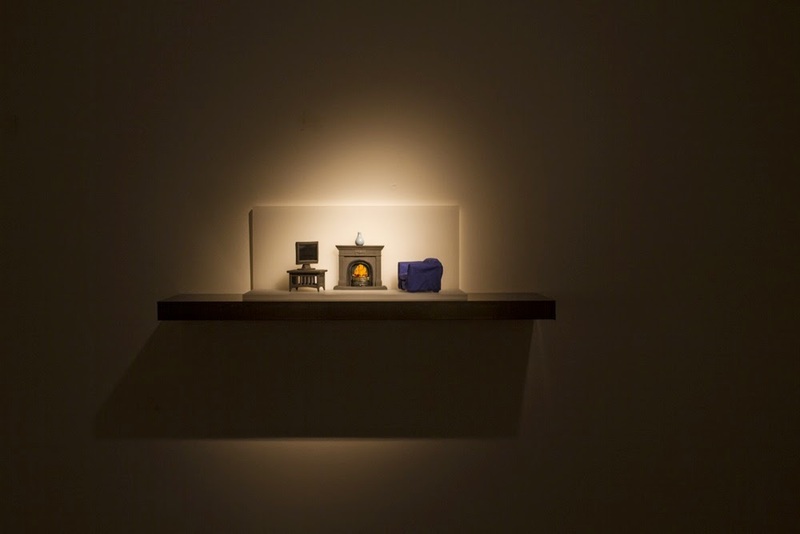 As part of my Studio Residency at Rua Red, Tallaght, I plan to focus this project on the Tallaght area, exploring the role that the home plays in today’s society, our ideological notion of what the home represents. During the residency I plan to organize workshops, talks, walks, public interventions, interview people, and photograph homes in the area. Through a variety of ways I would like to meet the people of Tallaght, and through the stories, drawings and objects that will emerge who knows what will happen. The first public event tool place at Tallaght library on Saturday 22nd February 2014. This was a family event where parents and children were invited to drop by and draw. The aim was to initiate discussion on what it means to have a home in Tallaght. Participants were asked to either draw their own or their imagined house. The response was great. Many young people came by, while parents sat and discussed their own stories and experiences of living in Tallaght. I also provided assistance with drawing architecture and perspective, however as many of the participants were young I wanted them to use their own imagination. The majority of the drawings were of an ideal home. Some who began to draw their own home ended up with an ideal home. 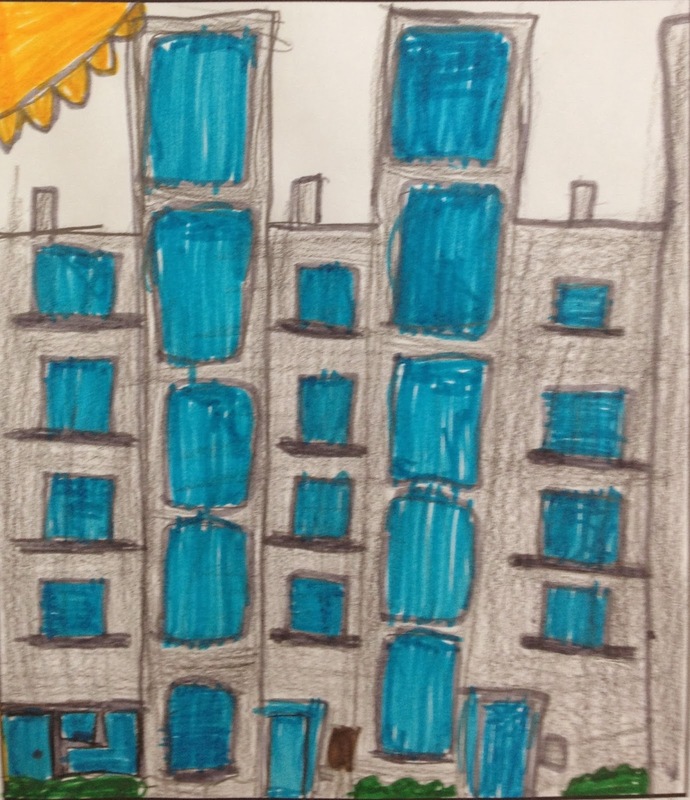 A nine year old boy drew his home as a wonderful colourful apartment block, he lives in an apartment. Images of ideal homes were both elaborate and simplistic. 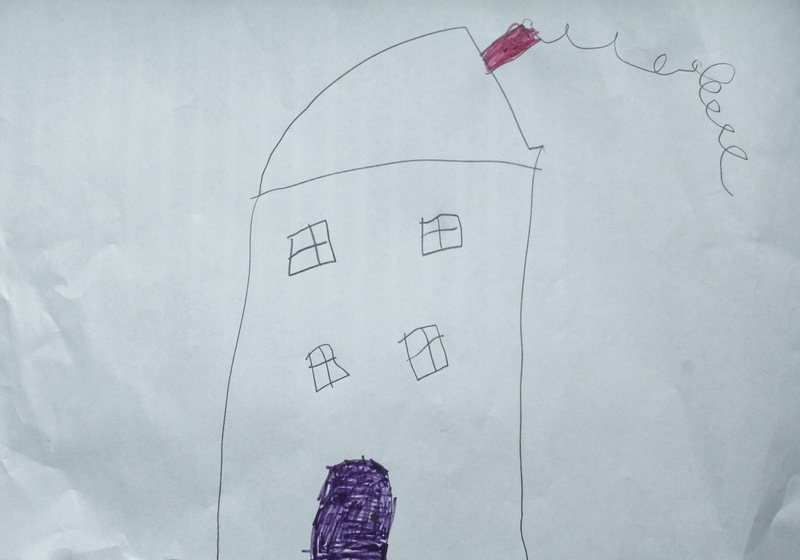 A drawing by a nine year old girl of a hotel was described as the ideal place to live in because it has a balcony. 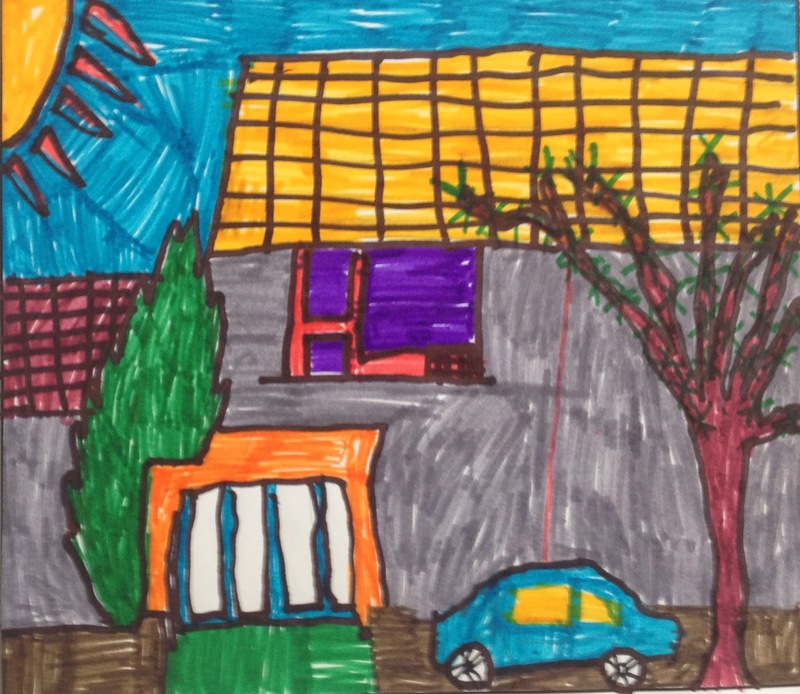 A ten year old participant who also lives in an apartment block, drew a very colourful yet modest semi-detached house as his ideal home. 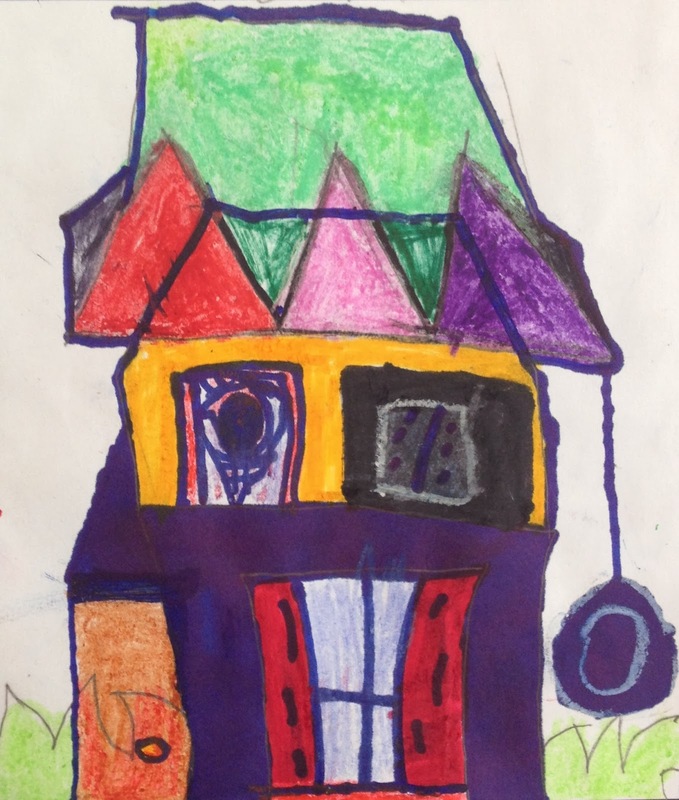 Another nine year old participant, who lives in a caravan, drew her ideal home as a detached two story house. The stories that emerged were interesting and I have agreed with a few parents to get in touch with them and continue the conversation. Below are images of some of the most interesting drawings. Today I spend the afternoon with a wonderful family living in the Springfield area of Tallaght. Tanya discussed her childhood in Tallaght, then she moved to Limerick where her first daughter was born, and later returned to Tallaght. Tanya loves living in Springfield in their rented house, with her two daughters Alisha and Allannah. Herself, her mum and the two girls welcomed me into their home with open arms. I held a workshop 'Whats makes a good home?' to Senior Infants from Saint Brigids JS, Brookfield, Tallaght, at Tallaght library. The class 5-6 year olds were asked what they enjoyed most about their home. One child pointed out that the sun only shines on one side of the house and not on the other side, she would like the sun to shine all around the house. When asked what their favourite room in the house was, most of the children named their bedroom as their favourite. 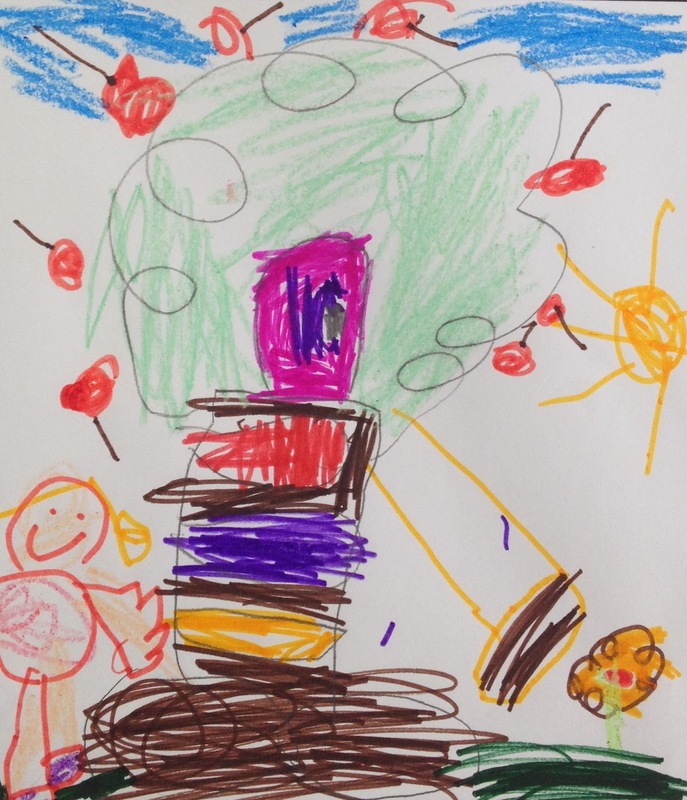 The children were asked to draw a house, either their own or an imagined home. 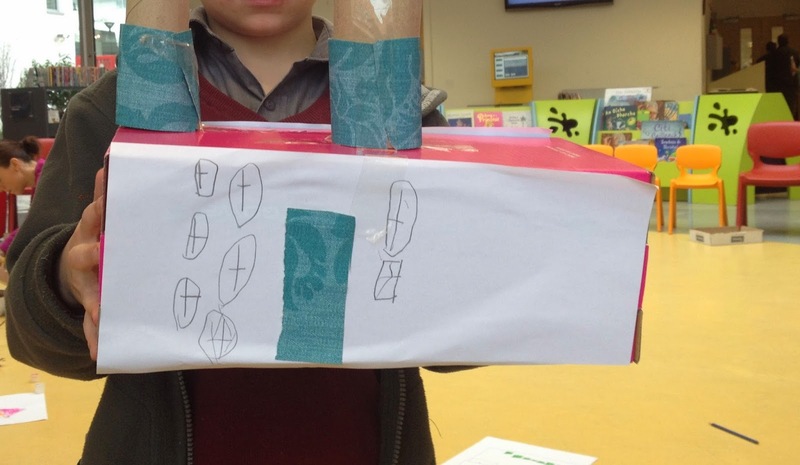 Six of the children came up with a standalone detached two-story house, four drew a multistory building, which one referred to as a hotel, three drew a castle, one a tower and one child drew a house on wheels. The children were then asked to build the house using cardboard boxes, paper, and basic materials. One child referred to the house he made as a ‘normal’ house, like his own house which is a two-story semi-detached house. Below are some of the houses designed. I held an Adult Art Workshop – Drawing the Built Environment at Rua Red. I covered sketching architecture of homes around Tallaght, basics of perspective drawing, and techniques for showing light and shadow. Attendee Jerry Dowd who lives in Tallaght had some previous drawing experience however he didn’t know much about perspective. We chatted about his experience of living in in the area and how much he has loved living in the area since 1970, originally from Kerry. He spoke about the great schools in Tallaght, and the expansive building of homes in the area since he moved here. The lack of shops and facilities in many housing developments was one thing he noted in many housing estates. 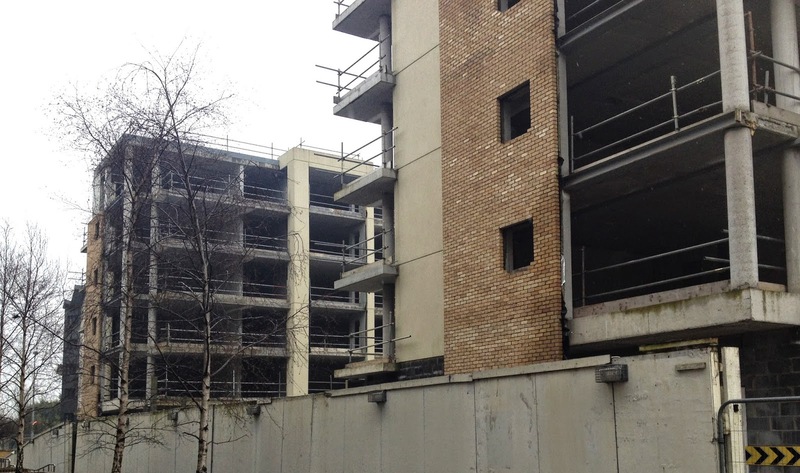 Today I visited a family who live in an apartment block overlooking Tyman Park on the Tallaght side of the M50. Located where Tyman castle once stood, it also has historical significance. Catherine was very warm and welcomimg, she even had a welcome sign up. This was not for especially put up for me though, one of her children made a few years back for a visiting relative and has not wanted anyone to take it down since. There are four children in the family, the eldest is a student attending UCD, who was at home. Catherine's husband travels for his work and spends most of the week away. The other 3 children were in school. Catherine spoke about her love for her home and the stories behind all the things she owns in it. She also spoke of the media's portrayal of Tallaght, how they highlight the negative and not so much the positives. From a personal experience people react in peculiar ways when she tells them she lives in an apartment and also in Tallaght. Her kids friends think they live in Spain, because they live in an apartment. I thought this was brilliant! I popped in for a visit to the home of Hemath and Kavin, two participants in the library drawing clinic. They're drawing stood out to me so I contacted their parents, who were so nice to invite me in for a chat. Their father was the first to move to Ireland from Southern India for work in 2006, followed by their mother a year later, and their two boys finally arrived in 2008 when Kamir was four and Hemeth was three. The boys remember very little about their life in India, Ireland is their home now, although their parents miss family back home. They purchased a two-bedroom apartment in Tallaght village in 2009. Both parents work as physios in Dublin, a job that is not easy to come by in India. The Bancroft apartments where they live are located on the Greenhills road overlooking on unfinished apartment complex. I really enjoyed meeting the family. I met David Kennedy, the founder and current editor of the Tallaght echo today. We had a very interesting conversation on David’s life in Tallaght. He has been living here all his life. He had agreed to share his story on camera. He also gave me a free copy of this week’s Tallaght Echo! Today I was in the Springfield again visiting Tanya. I took a lot of images around their home, and it was great to chat with here again. Her mother and Allannah were there also. She told me that it make more sense to live in a house than an apartment because of schools. She realised it was lot more difficult to access schools close-by when they lived in an apartment. I met with David Kennedy again today, I could listen to his stories about Tallaght for hours! Such an interesting life and man. He kindly offered me his time from his busy schedule to record his own story. I held a workshop in Rua Red for 5-12 year olds today on 'What Makes a Good Home?'. The attendance was great, 15 in total. 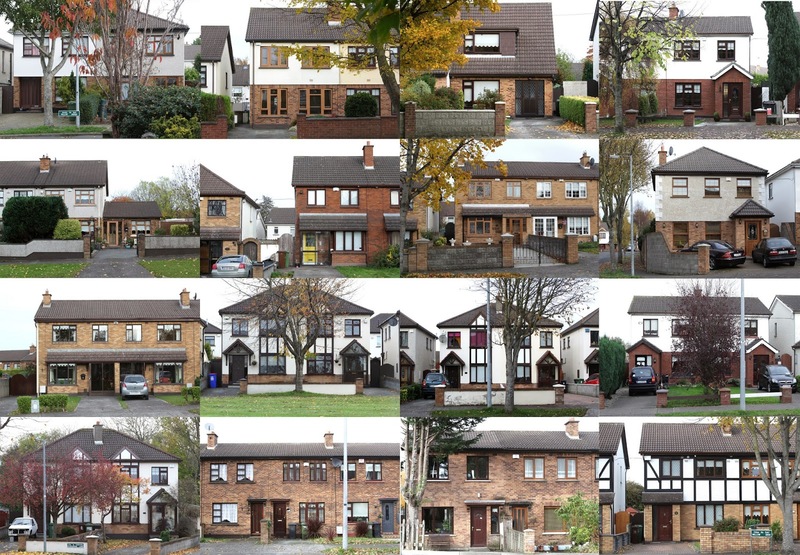 Many of children had great knowledge of houses in the Tallaght area, and recognized many of the photographs of different types of homes shown. They were surprised to see the variery of houses in Tallaght alone. Some of the children live in houses and some in apartments. When asked what they liked most about their home, a few mentioned the garden and others their bedroom. When asked if there was one thing they would change about their house two of the children said they would like a bigger garden, others mentioned a bigger bedroom, a bigger house or a bigger TV, funny! The children first drew a house, and then built this house using basic materials and show boxes. They could create either their own home or any of the house from the photos I showed. 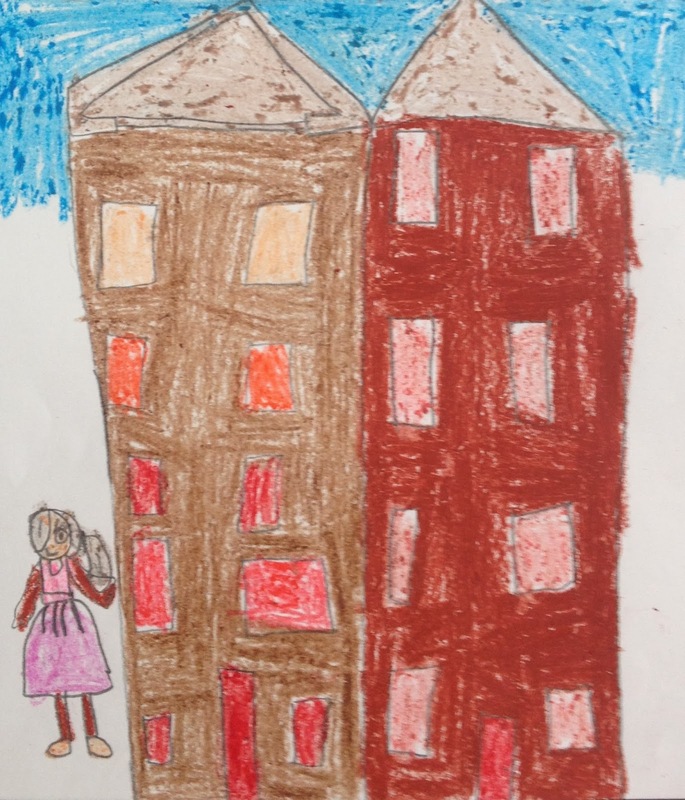 Here are some amazing drawings and images of the finished houses. 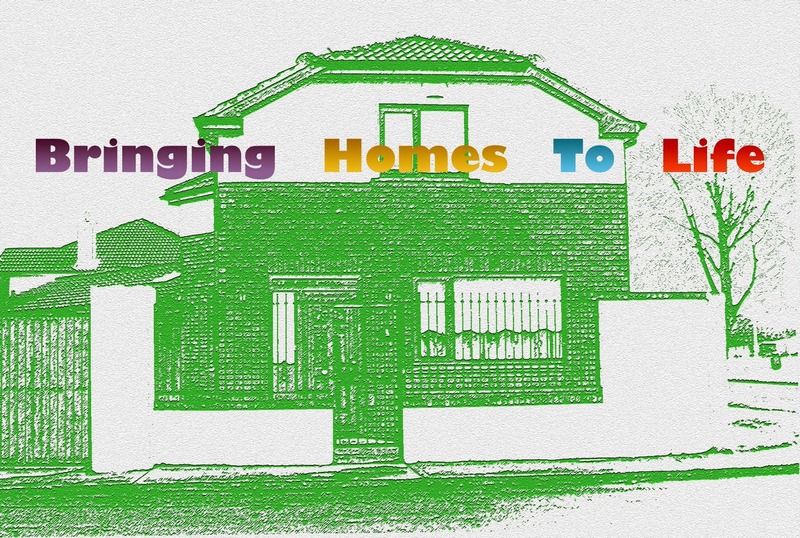 I held a workshop in Rua Red for kids 5-12 year olds, What Makes an Ideal Home. The children were introduced to different types of houses from around the world from a Tutor house to Georgian Dublin buildings. They set to work to create their ideal home. Firstly the children made a little person with plastercine to represent the scale of the house. Next they drew out the basic room/floor plan, and then went on to create a model of the house using either cardboard, foamcore or lolly sticks. I was surprised to see how quickly the children grasped the idea of a floor plan, and came up with their own designs. One girl had four rooms in her ideal home, a kitchen, a living room, a bathroom and a very large bedroom, as she explained the bedroom was most important of all rooms. Other children centred their homes around a living room with a TV. Many of the children thought that more than one room the in house was necessary. 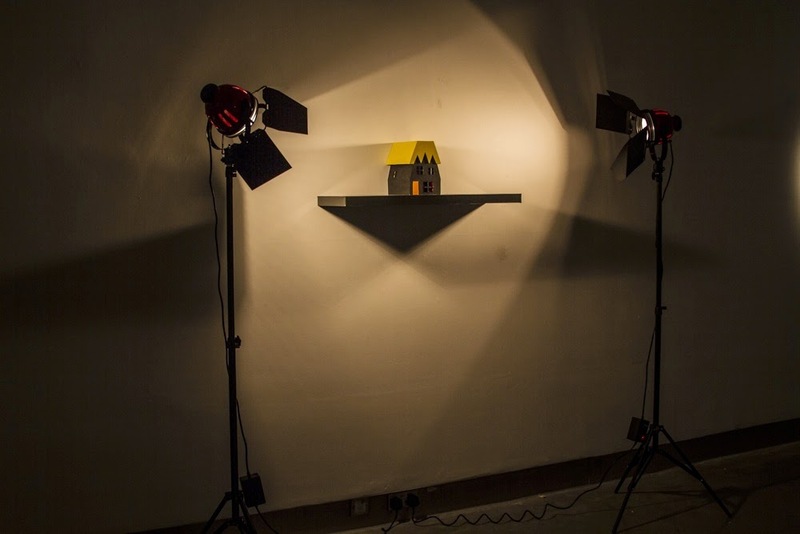 Below are some of the models created and images of the finished work. Today I met with Aidan Thomas, an very active member of the community in Tallaght. Aidan moved to Tallaght fifty years ago after he got married, he was raised in Inchicore in a corporation house. We had a very interesting conversation about the segregation of people and communities as a result of certain developments in Tallaght. Aidan suggested that 50 years ago people had more opportunities to integrate within the community, and to move from a corporation house to a private house. When he went to school in Inchicor, he mixed with the community, children from families who worked and did not work mixed in school, and also children from corporation houses and private homes. He felt that having friends like this helped him to stay out of Mountjoy perhaps. Also drugs were not part of society at the time, unlike today. Aidan has lived in the same private home in Bancroft since moving to Tallaght. He suggested that families, particularly single parent families, have fewer opportunities today to move into a private home. The poor and disadvantaged live a life of dependency and it becomes more difficult to break away from this life. This recalls a conversation I had with Tanya, living in Springfield, who told me of her constant dependency on social welfare, on social housing, as she spoke of the difficulty of breaking away from this cycle. There are very few opportunities for those living in council estates. Aidan also suggested that the core of personal development is family, which comes from community when he said and I quote “The core of society is community, the core of community is home.” The community and home are central to children’s development, if community and home are destroyed, then this destroys society. He suggested that there should be more interaction within communities. Perhaps such concerns might be the root of the perception the media have of Tallaght. Aidan Thomas kindly invited me into his home today. He lives in Bancroft. He showed me his home and spoke of his wife's love of their home, particularly the creative input she has had on it. Today I ran a drawing and perspective workshop for transition year students of Coláiste De Híde, Tallaght. We began by drawing the room and then spoke of the different types of houses in Tallaght, drawing from objects in the room, and from photographs using two-point perspective. Below are some of the work from the students. I had a meeting with Ger Bates today, who lives in Old Bawn. He has worked extensively in the community and also has been involved with community project with Aidan Thomas well. Ger was great in suggesting residents in the area, both young and old, for me to get in touch with. I also went back to Kate's house. Her lovely daughter Genevieve was there again. I took some more photographs, and had a cuppa and a chat with Kate and her husband. Today I visited Anne Carey in Brookfield. Anne works in a drugs rehabilitation centre in the area. She moved to Brookfield when it was first built over 20 years ago. We had a lovely chat about her life, family and for someone who has visited many homes in the area, she has lots to talk about. We have agreed to meet again to chat and record Anne's story on life in Tallaght. While driving around Brookfield I took it upon myself to begin photographing windows and doors of houses in the area. This I find more interesting than photographing the full facade, and questions the ability of the viewer's representation in placing the window or door. Below are some examples. Today I was back with Anne Carey in Brookfield. She was happy for me to interview her however did not wish to have her home photographed. She did however allow me to take a photo of herself and one personal object that was close to her heart and life in Tallaght. Today I met Shiela Bates, wife of Gerry, and a group of ladies who meet for weekly coffee on in Rua Red. The ladies meet as a group to do meditation and various relaxing techniques. They spoke of what the home means to them. I couldn't chat for long as I had to do a drawing workshop but I will meet with them again next week. I held a Drawing Architecture workshop in Rua Red today and it was great to get an different age group who are interested in drawing. One participant had very little or no drawing experience, and another was a practicing artist so there was a great variety. First participants did a drawing from memory of a room or a space in a living area in their home. 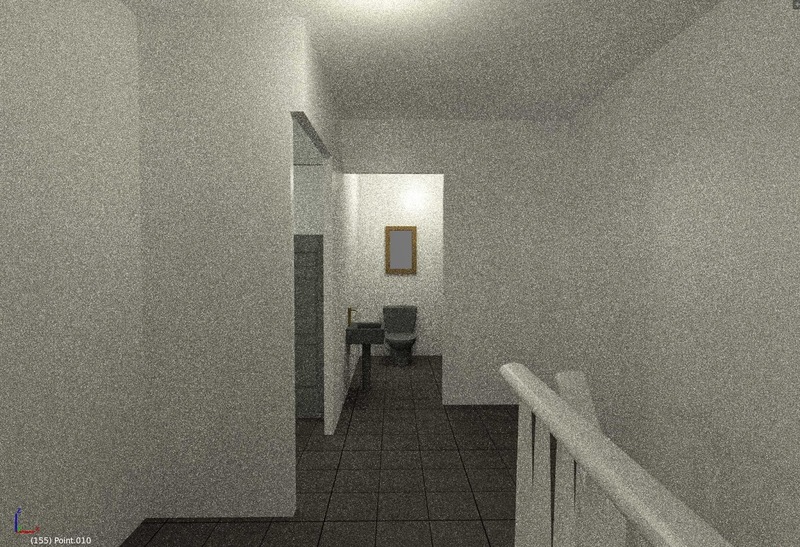 Below was one impression of a participant's living area. We spoke of perspective and improving the drawing, and following on to do a drawing of a building or a part of the room. The below is one of the participants drawing outside (before the rain came down), and her drawing. I met up with the group of ladies who call themselves the Capacitar group today in Rua Red. We spoke of objects that are personal within the home and we had a chat about what they would like to do as part of my project. The ladies have agreed to go meet in a two weeks and bring with them an object from the home that has a special place or story behind it in relation to their own home. One example from a lady in the group is a statue of Mary that has been in a family for over 200 years with a broken nose, she feels there is something important when beside it. I held a Modelling the Built Environment workshop today for teenagers and pretty much anyone. Had a few participants who were very keen. 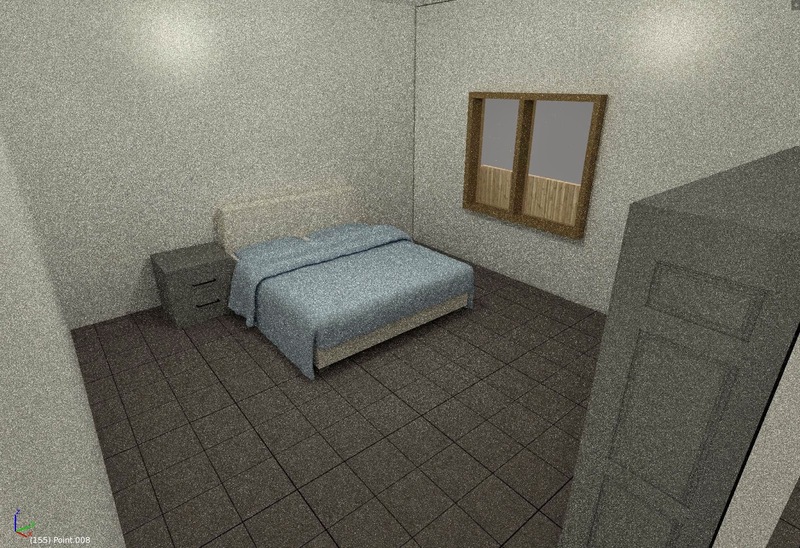 Below are images from one participant's ideal house design. Today I met with a few ladies from the Capacitar group in Tallaght. We had a discussion around the importance of home. One of the ladies Valerie brought in a very old teddy bear that she has had since she was four years old, that's nearly 50 years. The teddy has always been in her home and moved around the world with her. It's a special object that reminds her of home. 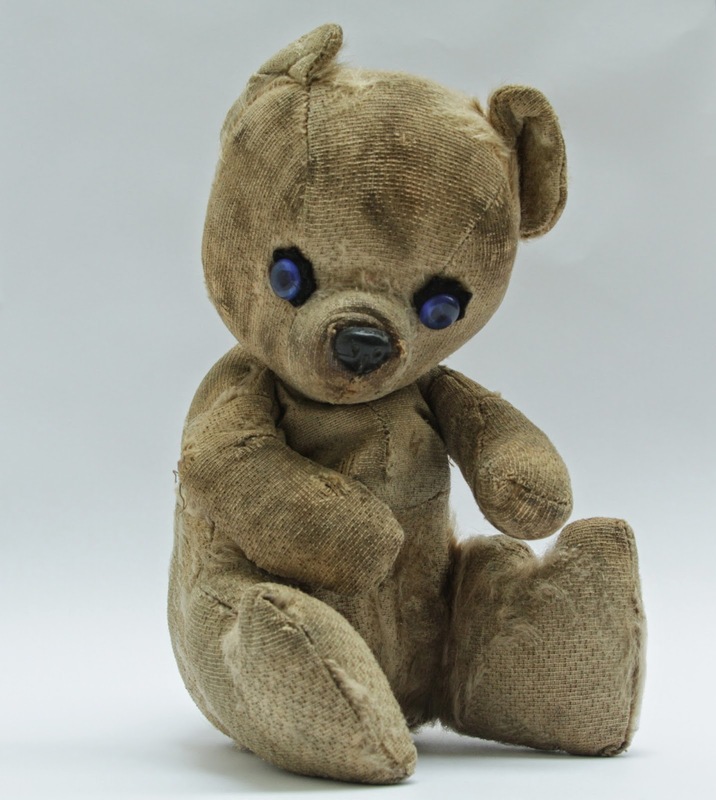 Below is the teddy with blue eyes. I plan to meet the ladies again in a few weeks when they are all around, and they are going to bring in a personal object from the home to discuss. I ran a kids workshops for 4-8 year olds today based on the theme 'My ideal house'. The idea was the children worked in teams to build one house or adjacent homes, designing their own. Below are some of the lovely work by the children. Met with the Capacitar group today with a very large attendance, eighteen ladies present. Each person brought in an object that signified what home means to them. One lady even sang a song about her childhood home living with her grandmother. Below is a book for one of the ladies whose parents bought it for her when she was four as she was the only child for a number of years. 'My Child' is about childhood and she now reads it to her own child. What have I been upto for the past few weeks? Well I've finally been stuck in making the work. I had an Open Studio for Culture night which was a great opportunity to test out a few pieces. I visited the carboot sale in Tallaght a few times and last Saturday I found some two old china cups - just what I was looking for! I've been taking photographs around Tallaght. Today I had an open studio coffee morning inviting all the project participants. There was a great turnout, many members of the Capacitor Group came, along with movie participants.. It was a great way to discuss and get feedback on the work, while making sure those involved were happy with the outcome. 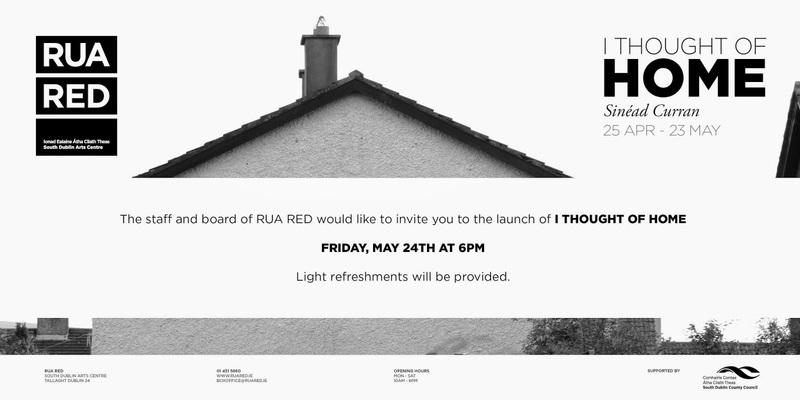 Studio in Rua Red has been extended until the exhibition. Lots of productivity to come. Today marked the opening of the project exhibition 'I Thought of Home'.